Ferrari's Fernando Alonso says he does not feel under any pressure after McLaren's Lewis Hamilton narrowed his championship lead. Hamilton's win in Italy two weeks ago moved him to second in the standings, 37 points behind Alonso, with 175 available in the remaining seven races. "I'm not under pressure at all. I'm probably the only one who can afford a mistake or a retirement," Alonso said. "The others cannot, so I think it is much more pressure [for them]." Ahead of this weekend's Singapore Grand Prix, Alonso and Hamilton are the only two drivers to win three races this season, but Lotus driver Kimi Raikkonen, Red Bull's Sebastian Vettel and his team-mate Mark Webber are all tightly packed behind the Englishman and in the championship hunt. McLaren have won the last three races, with Hamilton's victories in Hungary and Italy sandwiching Jenson Button's in Belgium, where Alonso was taken out in a dramatic, first-corner collision. Ferrari, like all the top teams, are introducing a series of new components at this race. As a result, Alonso is confident he can fight for pole position and victory both here and in Japan and Korea next month. "We need to recover in the next two or three races," said Alonso, who was world champion in 2005 and 2006. "It is true McLaren are in very good form and are favourites after the last two or three results, but it is up to us to improve a little bit the pace. Let's see what we can do. "Everybody is strong at the moment and everybody is a contender. Still five or six drivers can fight for the title." 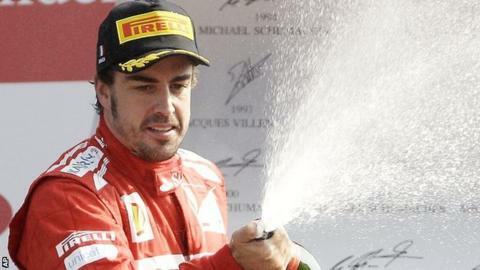 Alonso reiterated his long-held view that Hamilton, world champion in 2008, is the main threat to his own title hopes. "Lewis is the one I respect most because I know what he can do with good cars and bad cars," said Alonso. "He is again the favourite for this one." "We are bringing some new parts to the car and we are optimistic we can do well here and in the next two or three grands prix." Hamilton said: "It's going to be tough to catch Fernando. He has had an incredible run throughout the year, just great consistency. "I just hope we can try to do a better job and we can close that down." The McLaren driver added that he believed the championship battle was still wide open. Hamilton said: "[Vettel] is the reigning world champion. He's an incredibly strong candidate for the championship still. They have a great car. They've performed pretty well all year apart from perhaps the last race. I anticipate they will be very hard to beat here again. "Lotus have been quick all year eventually they're going to win. Where it will be who knows, maybe it will be here." Red Bull's Mark Webber agreed, adding: "We have a long, long way to go. No-one's dominating at the moment. OK, you might say McLaren had a little bit of a roll but no-one is dominating anything. "It's very tight. I'll be very surprised if in the next few races we have people dominating. I'm not sitting here saying we'll have a dominant car but we will have a car with which we can challenge for wins and that's all we can ask for."